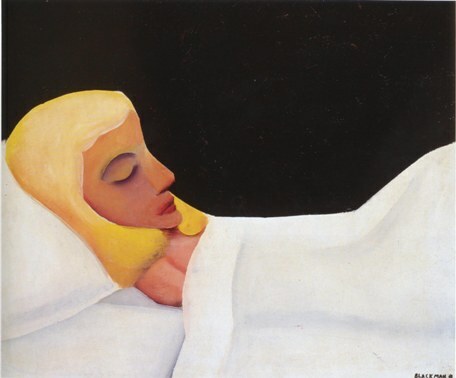 Charles Blackman was a self taught painter. As a voracious reader, he learned from reference material which he scoured and from looking at the work of other artists. The two most important influences on the young Blackman were the precocious French poet Arthur Rimbaud and the symbolist painter Odilon Redon. Through them, Blackman evolved a philosophical view that for him, art making was primarily autobiographical. His first significant works executed in the 1950s was the Schoolgirl series in which Blackman spun the duality of dream and reality. In 1952, he held his first exhibition in his studio in Hawthorn. About this time he met art patrons Sunday and John Reed, and Barbara Patterson, a writer who was to have the most profound effect on his life. Through Barbara who was blind, Blackman developed a deeper understanding of literature, frequently reading to her, He found through the process of reading aloud that he processed and absorbed imagery more deeply. On hearing Lewis Carroll's Alice In Wonderland from Barbara's talking book, where the enquiring Alice, physically changed as she moved through to her new world, seemed to mirror Barbara's extended body shape as Barbara reached the end of her pregnancy. The following Alice series is a tribute to Barbara 'to give sight to her poetry'. 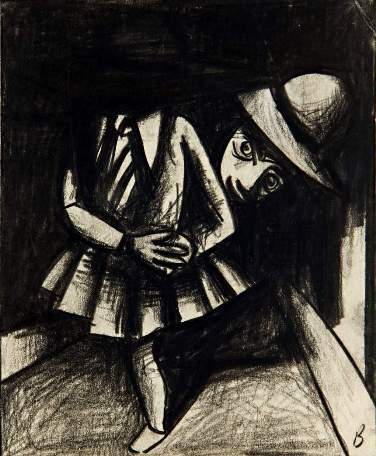 Blackman and like minded figurative painters including Arthur Boyd, John Brack, John Perceval, Robert Dickerson, David Boyd and Clifton Pugh all dedicated to the figurative, demonstrated their opposition to abstractionism in a jointly held exhibition ''The Antipodeans'' in 1959. Again exploring duality, Blackman's work of this time revolves around girls and both real and imaginary bouquets of flowers, where he uses the flowers and colour to express shades feeling. "This work is a journey through a strangely intense but various territory. His paintings are often dark with submerged threat and danger, but these are part of the forces which the innocent, the voyager, must encounter if the journey is to be made." (May, 1988). During the 1980s, Blackman spent considerable time working on sets for a number of ballets. The sets for Alice in Wonderland, were described as 'stunning' by the Australian newspaper. In 1987 he is responsible for establishing the concept behind the Moet et Chandon Australian Art fellowship for young Australian painters to study in France. Blackman's images of the hidden strengths and resourcefulness of those who are vulnerable children, women and the blind project a power that has not been dimmed by time. His imagery speaks on a universal level. Blackman is represented in the National collection and in all state galleries in addition to private and corporate collections throughout Australia and internationally.